“Grand Hotel on a train.” That’s how they referred to “Shanghai Express” when it was released in 1932 the same year as “Grand Hotel”. I can see why someone would make that facile comparison. Both films take place in a limited space and involve an array of diverse characters who interact, some who had known each other in earlier times and some who are meeting for the first time. But I feel this comparison does “Shanghai Express” an injustice probably because when it comes to exotic European beauties I’ve always preferred Marlene Dietrich to Greta Garbo. “Shanghai Express” concerns a train traveling from Peking to Shanghai in 1931, a time of great upheaval when China was in the midst of a civil war. On board the train is Captain Donald (Doc) Harvey (Clive Brook), a surgeon. As he is boarding the train, his friends tell him how lucky he is to be on the same train as the famous Shanghai Lilly. He’s never heard of the woman so his friends explain that she’s a coaster. “A woman who lives by her wits along the China coast,” in other words a courtesan, a kept woman. 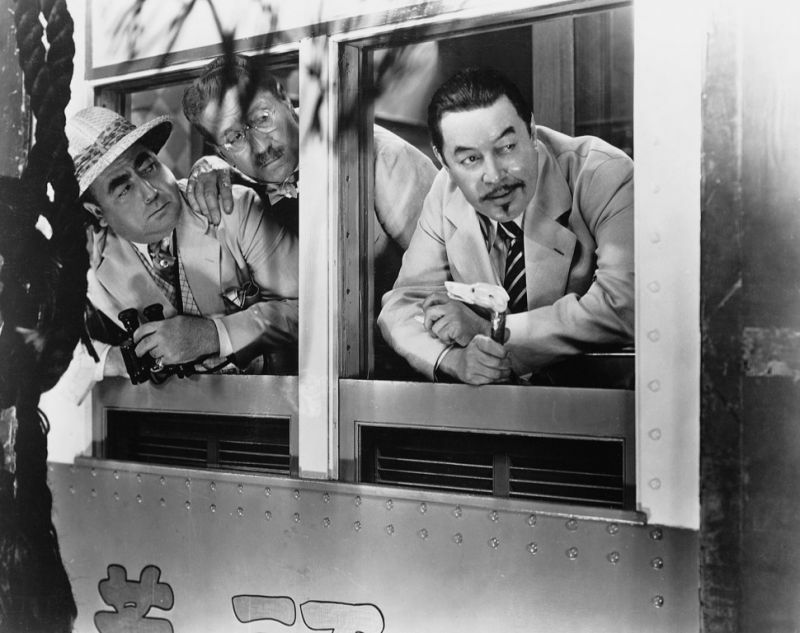 Other passengers on the train include fellow coaster Hui Fei (Anna May Wong) who shares a compartment with Lilly, missionary Mr. Carmichael (Lawrence Grant), gambler Sam Salt (Eugene Pallette), opium dealer Eric Baum (Gustav von Seyfferitz), boarding house keeper Mrs. Haggerty (Louise Closser Hale), French officer Major Lenard (Emile Chautard), and Eurasian businessman Henry Chang (Warner Oland). Mr. Carmichael and Mrs. Haggerty are none too happy to be sharing accommodations with women the likes of Lilly and Hui. When Mrs. Haggerty, unaware of Lilly and Hui’s profession, tries to make their acquaintance and informs Lilly that she is the keeper of a boarding house. Lilly playfully asks her, “What kind of house did you say?” Mrs. Haggerty realizes the terrible mistake she has made and storms away. When Captain Harvey runs into Lilly on the train he recognizes her as Magdalen, a woman he had a relationship with five years previous. He tells her that he’s thought of her every day since they parted and mentions that she seems changed but he can’t quite explain how. “Well, I’ve changed my name,” she replies. “Married?” he asks. “No. It would take more than one man to change my name to Shanghai Lilly.” And so Captain Harvey learns that his former lover has become a prostitute. Can I just take a moment to note that this is one of the best single lines I’ve ever heard in a film? That line should have been given a special Oscar for screenwriting in 1932. In a later meeting on the train, they discuss old times and it becomes clear that both Captain Harvey and Lilly regret their former parting. Lilly explains that she played a woman’s trick on Doc to make him jealous. She wanted to test whether he really loved her but she lost him instead. Chinese government forces later stop the train and examine the passports of all the passengers. After they take away a person who we assume must be a rebel agent, Chang makes his way to a telegraph office where he sends off a coded message. When the train next stops to take on water, it is overrun by rebel forces of whom Chang turns out to be the leader. It turns out that the agent the government took off the train was a high ranking official in his army and he wants him back. One after another Chang questions the passengers in search of someone important enough to use as ransom to retrieve his comrade. He finds what he is looking for in Captain Harvey who is on his way to Shanghai to perform life saving surgery on the Governor of Shanghai. While Chang is waiting for a response to his request for an exchange of prisoners, he approaches Lilly and offers to make her his woman, promising to make her very comfortable. Lilly refuses, obviously having in mind that she will change her ways now that she has been reunited with Captain Harvey, but Chang refuses to take no for an answer and begins to force himself on Lilly. Captain Harvey, overhearing this from the next room, rushes in and knocks Chang down. Chang, realizing that he needs Captain Harvey alive if he is going to exchange him, lets this insult go. Still sexually unsatisfied, however, he sends for Hui Fei and rapes her. When a train carrying Chang’s comrade arrives, it is time for Chang to return Captain Harvey and allow the train to Shanghai to continue its journey but he tells Lilly that he cannot overlook the insult that Captain Harvey has given him. He’ll send him back but he’ll blind him first. Lilly offers to give Chang all the money she has if he’ll refrain from harming Captain Harvey. Chang refuses but he says he’ll change his mind if Lilly will agree to go with him. Lilly reluctantly consents. As the Shanghai train is preparing to leave, Hui Fei takes advantage of the confusion and sneaks into Chang’s headquarters. She finds him alone and kills him. With Chang dead, Lilly is free to board the train and they speed off before Chang’s body is discovered. With Lilly and Captain Harvey safely on board the train, it would now seem that they could resume the relationship of five years previous but now Captain Harvey rejects Lilly saying she couldn’t possibly love him still if she was willing to go off with Chang. Lilly’s pride stops her from telling him why she was willing to join Chang. At this point, the Reverend Carmichael takes an unexpected role in their reunion. He had previously seen Lilly praying for the safe return of Captain Harvey when he was being held by Chang and he is now convinced of her good qualities. He demands to know the reason why she was willing to join Chang and Lilly tells him, insisting that he not tell Captain Harvey. She doesn’t care to “bargain for love with words” and insists that Captain Harvey believe in her good qualities through faith alone. Carmichael agrees but still speaks to Captain Harvey telling him that “she is worth a dozen of you” and insisting that in love as in religion one must have faith. Finally, the train pulls into Shanghai station (only four hours late). There, during their parting, Harvey tells Lilly that he cannot live without her. Nothing matters but that she is with him, and he apologies for his lack of faith. The film ends with them in a clinch. There you have it. A fairly simple plot, but to fully understand “Shanghai Express” one must have an understanding of the relationship of director Josef von Sternberg and its star Marlene Dietrich. Born in Austria, Sternberg’s family immigrated to the US when he was fourteen. As an adult, he became a contract director for Paramount, directing silent films in the 20’s. When Emil Jannings was looking for a director for his next film which was to be a joint production by Paramount and the German production company UFA, he turned to Sternberg who had directed him in the silent “The Last Command” (1928) for Paramount. This film was “The Blue Angel” (1931) and for the film’s title character Sternberg cast Marlene Dietrich whom he discovered performing in a cabaret. Filmed simultaneously in both English and German, the film was a huge international success and made an overnight star of Dietrich. Paramount then brought Dietrich back to the states and over the next five years Sternberg and Dietrich made another six films, with Dietrich, in a very real sense, becoming Sternberg’s muse. He did his best work when directing her, crafting for her an exotic, glamorous film persona. When he left Paramount in 1935, he never worked with Dietrich again and never attained the same level of success. For the six films that Sternberg made with Dietrich for Paramount, he was given almost complete autonomy and exercised extensive control over the production. He often had a hand in writing the screenplay, shooting and editing the picture. When one considers the directors of the 30’s, one doesn’t often find an auteur. It’s difficult to put your stamp on a film when you’re only given two weeks to prepare and a month to shoot. But Sternberg is the exception. He was able to imbue each of his films with Dietrich with a similar mood and tone. Each of the films takes place in an exotic locale and offers the viewer romance and escape, but above all stunning visuals. This is what I find most impressive about “Shanghai Express”. You are unlikely to find a more beautiful black and white film than this one. Sternberg in his autobiography “Fun in a Chinese Laundry” said, “a shaft of white light used properly can be far more effective than all the color in the world used indiscriminately.” One can imagine he was thinking of the scene in “Shanghai Express” in which Lilly and Donald discuss their recent past sitting outside the back of the train. Dietrich’s eyes dart back and forth coquettishly as she asks Doc about the time since they parted. The close-ups in this scene seem as if they were filmed by a fashion photographer. Dietrich has never been more beautiful. Cinematographer Lee Garmes won the Oscar for Best Cinematography for “Shanghai Express” but Dietrich claims it was Sternberg who was responsible for the film’s look. 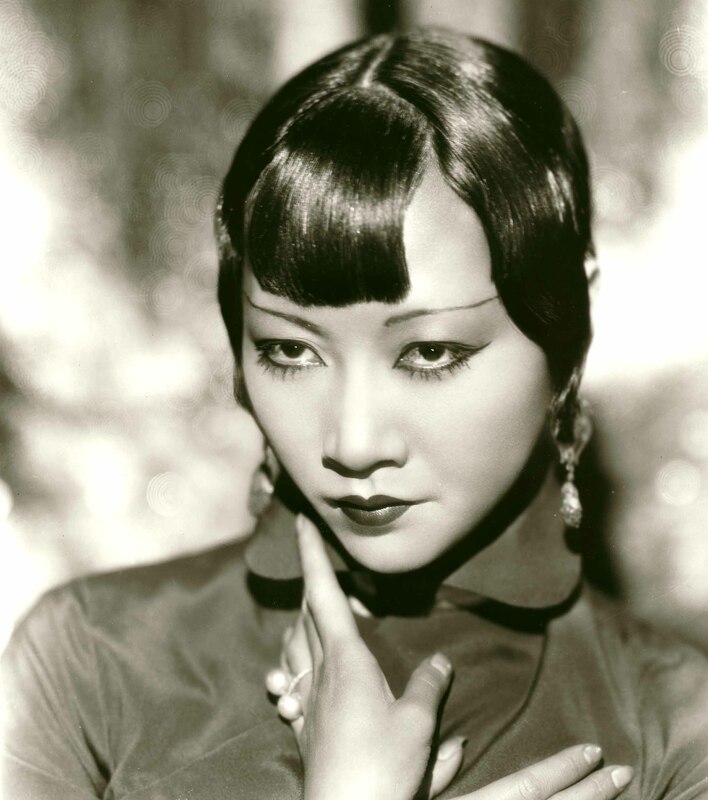 “Shanghai Express” is also notable as being one of the best films to show off the talents of Anna May Wong. Wong was the first Chinese American movie star and one of the first Asian American actresses to gain international attention, but her career in Hollywood was seriously hamstrung due to the anti-miscegenation rules in the Hays code. She was not allowed to exchange an on-screen kiss with any non-Asian actor, even if that actor was portraying an Asian character. Further limiting her career was the desire producers had of casting western actors in leading Asian roles. The most egregious example of this was in the casting of the film “The Good Earth” based on Pearl S. Buck’s popular novel. Wong dearly wanted to play the lead role of Olan and lobbied hard for the part but was passed over for German actress Luise Rainer. Instead she was offered a part as one of the few unsympathetic characters in the film, which she refused to take. “If you let me play O-lan, I will be very glad. But you’re asking me – with Chinese blood – to do the only unsympathetic role in the picture featuring an all-American cast portraying Chinese characters.” The mind reels. The role of Hui Fei in “Shanghai Express” is small but distinctive. Wong comes across as a fully rounded character instead of the Asian cliché that she could have been. Hui is seen as the equal of Lilly and they seem to share a friendship, both women listening to hot jazz records on a phonograph in their compartment. Best of all her character demonstrates real agency. Though raped, Hui takes her revenge for this act and through it allows for the reunion of Lilly and Harvey and the successful conclusion of the film. After seeing this film and learning more about the career of Wong, I would love to see more of her films, including the silent films she made earlier and the B pictures she made later for Paramount. Perhaps Star of the Month on TCM? “Shanghai Express” turned out to not just be a beautiful film but also a huge hit. The film resonated with audiences seeking an escape from the realities of The Great Depression and became the highest grossing film of 1932 surpassing even “Grand Hotel” at the box office. The film had mixed results at the Academy Awards the following year. Best Cinematography was the only award the film garnered but it was nominated for two others: Best Picture and Best Director. Alas Marlene Dietrich was not nominated for Best Actress but then neither was Garbo for “Grand Hotel”. Then as now the Oscar winners never seem to be the films that people remember. If you’re looking for a stunningly beautiful film that successfully mixes action and romance, you won’t go far wrong in giving “Shanghai Express” a look. Check out that gear phonograph. Swedish American actor Warner Oland often played Asians most notably as Charlie Chan in the popular film series. Keep an eye out for the extremely slow and languorous dissolves that are used in “Shanghai Express” some lasting as long as five or six seconds. “Shanghai Express” is loosely based on Henry Hervey’s story “Sky Over China” which was based on a real life incident where the train from Shanghai to Beijing was captured by Chinese rebels and exchanged for prisoners held by the Chinese government. The phonograph Lilly plays is an Odeon portable made in Germany. I am now on a hunt for one so let me know if you see one for purchase.